There were rumors about the same making rounds from quite some time and finally AOL, an Internet services and media company, has closed down its Indian property AOL.in. If users try to access the site, they are automatically redirected to CoolAge, a site dedicated towards college students. Earlier in March this year, TechCircle.in had reported of AOL's plans to fire its India team. The layoffs in March had followed the company's acquisition of Huffington Post and Techcrunch in February. Additionally AOL has also shut down a lifestyle site particularly for men called Asylum.in after 3 years since its launch in 2008. Although the site is still accessible, it contains a message about its shutdown on the homepage. AOL is looking to add several content sites to its portfolio globally through acquisitions and organic launches. Reuters had recently reported that AOL is launching B2B content business by launching verticals such as government and energy. 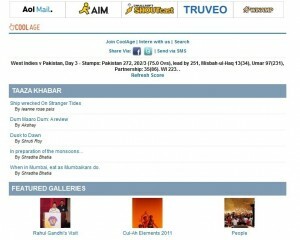 AOL.com is still online but the lack of Indian centric content on the site indicates it not focused on India anymore. The users can still access their emails via www.webmail.aol.com.